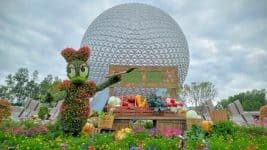 One of the best reasons to visit Walt Disney World in the fall is Mickey’s Not So Scary Halloween Party. 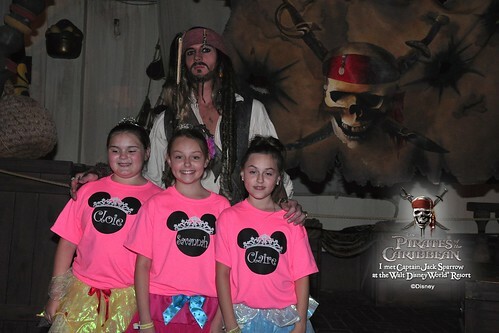 This is an event we’ve yet to experience ourselves, but fellow DisDad Adam Dale had the opportunity to attend the party not once, but twice this year. He was kind enough to share his experiences with us. I’m a proud member of the DisDads, a great group of Disney-loving guys I discovered a few years ago online. 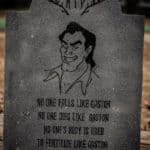 This supportive, funny, and generous gang has their own website: DisDads.com, a DisDads facebook group, its own forum on the DisBoards, as well as its very own podcast. 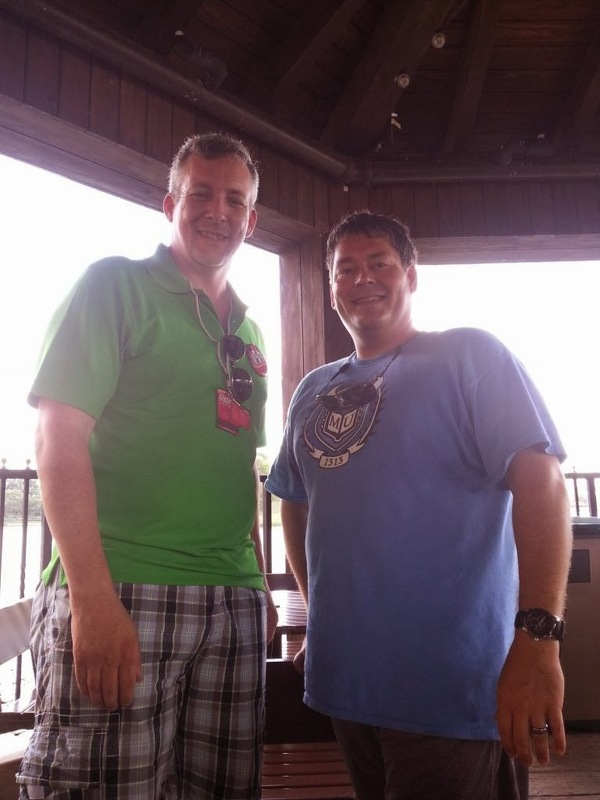 I’ve had the pleasure of meeting several of my fellow DisDads in person since I’ve joined the group, including Adam Dale. 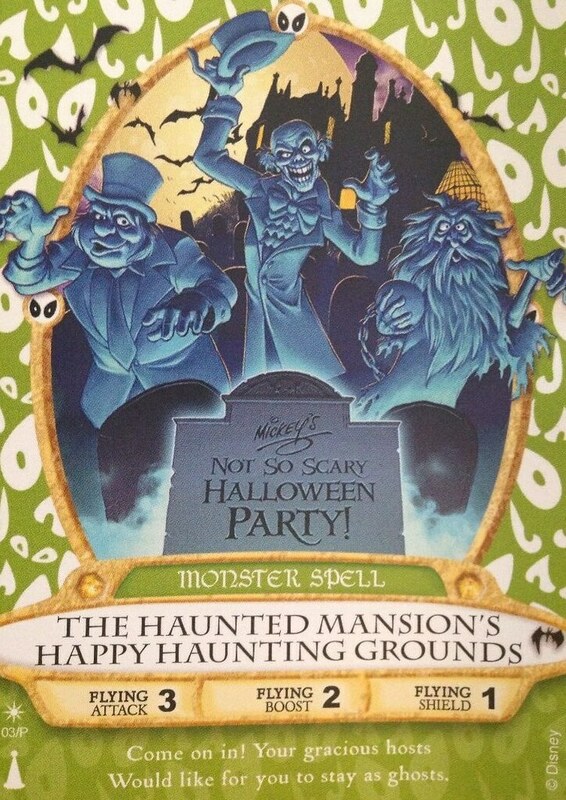 Mickey’s Not So Scary Halloween Party (known as MNSSHP by all those Disney die-hards in these interwebs) is a hard ticket event (meaning it’s not included with your normal park admission) costing around $62 per adult. The party offers lots of party only meets and greets with rare characters (think the 7 dwarfs and a host of villains), a special “Boo to You Parade”, trick or treating, dance parties, and of course a special fireworks show called “HalloWishes”. 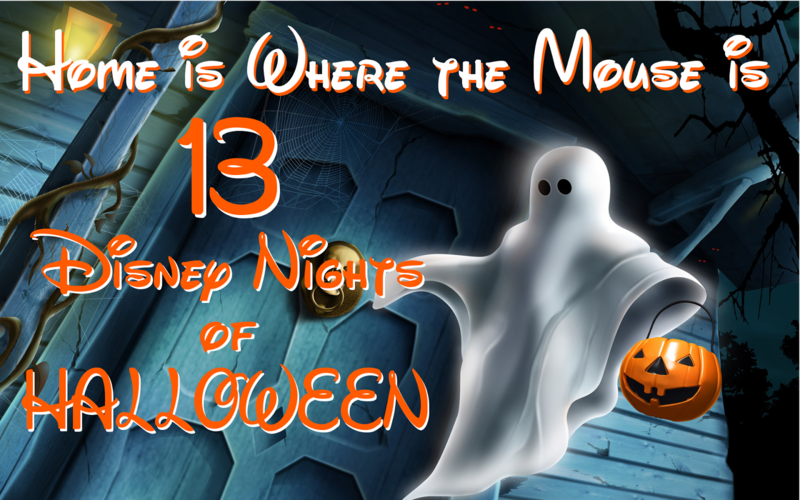 There is so much to do that you will find a hard time getting it all in during the 5 hour duration of the party! 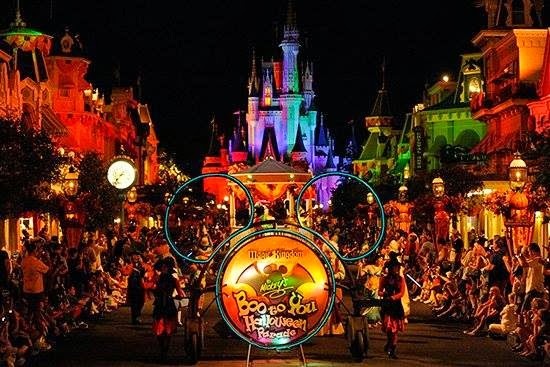 Also, though some are aware but many may not so I will mention it here, the party starts at 7pm and ends at 12am, but your admission to the party will let you enter the gates to Magic Kingdom at 4pm on the day of the party! 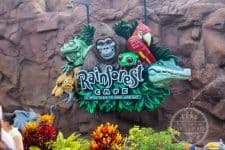 I highly suggest you take that extra time to get on in the park, do some merchandise shopping, grab a bite to eat and get ready for the night’s adventures! *Another helpful trick here is to go back to Sorcerers training area behind the Christmas shop in Liberty Square to avoid the long line at the Fire station on Main Street. Next, we did some browsing and just wandering around, taking in all the costumes of the guests (some are truly awesome!). At 6pm we planted ourselves in the line to see The Seven Dwarfs (this line gets to be well over 1hr to 1.5hr once the party starts and you don’t want to waste limited party time in line!) 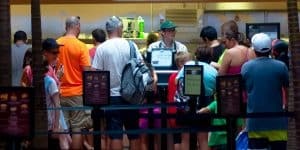 While I stayed in line the kiddos, and wife went to grab some food and come back. We ended up being 3rd in line but once the party started at 7 the line was a few hundred people long! 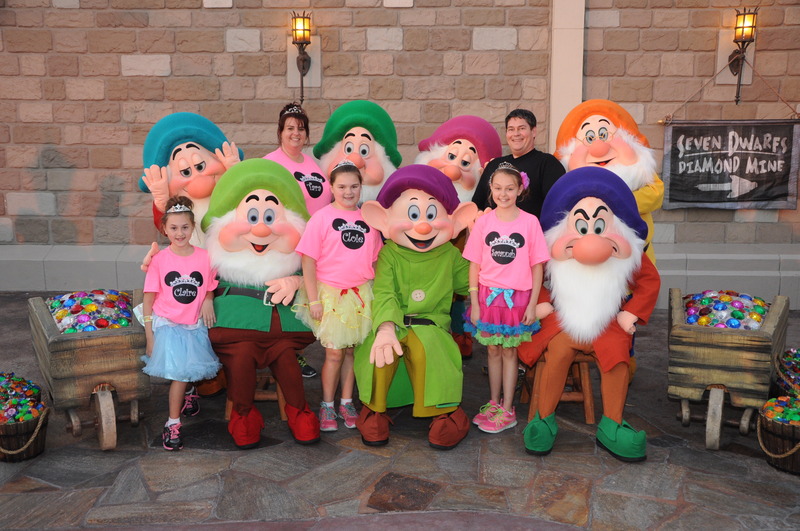 We were done with our meeting with the Dwarfs 10 minutes into the party. 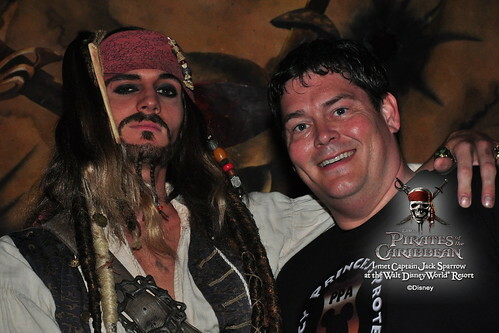 So it was off to trick-or-treat as we made our way to see Captain Jack Sparrow! 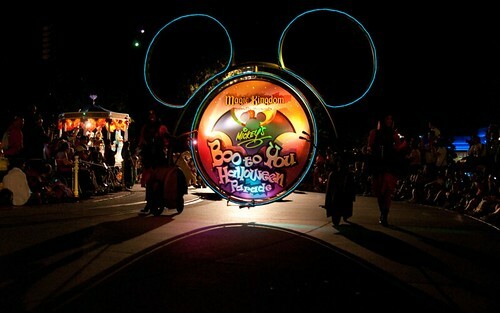 After Jack and some more candy grabbing, we moved back over to Frontierland , to catch the “Boo to You Parade” (this by far is the best parade that WDW has and is not to be missed!) . Before the Parade starts the “Headless Horseman” rides the parade route. This is very cool to see, but we didn’t have a great view here of him though. We were near the cut through the building from Frontierland to Adventureland (near the Magic Carpets of Aladdin) so we crossed out to Adventure Land , down to the hub, around by Crystal Palace, and into the side entrance to the shops of Main Street (which were EMPTY) so we made it all the way to the fire house , crossed the street to an empty area and sat down and watched the Parade AGAIN! 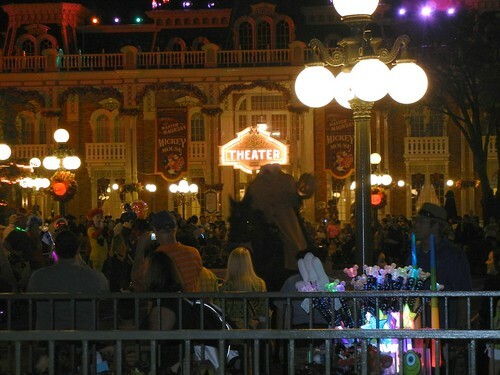 *Everyone told us to watch the parade in Frontier land or Liberty Square, but for both parades on both nights we attended, this spot in front of the Fire Station, right where the parade ends was near empty. 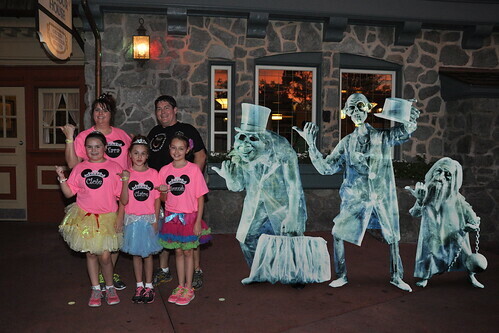 Once the 1st Boo To You Parade is over making your way to the hub for Celebrate the Magic and HalloWishes is a MUST so that is what we did! You will not be disappointed seeing HalloWishes anywhere in the park that you can see Cinderella Castle, but being in the hub the 360 degree circle of fireworks doing the end of the show is truly immersive and impressive! 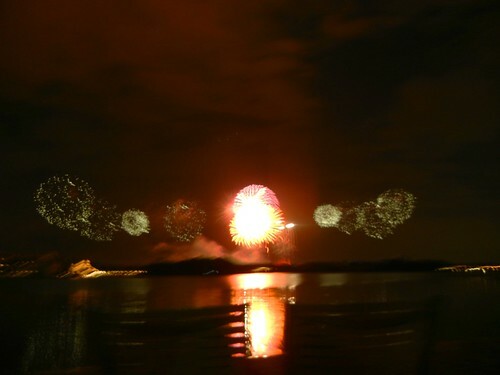 HalloWishes seen from across the Seven Seas Lagoon. *Dads tip here, PUT DOWN THE CAMERA, THE PHONE and whatever else you think you’re going to capture the fireworks and show with, ENJOY the SHOW, unless you are needing the footage for some blog, site or report, and by the way you probably don’t have the gear or the skills to truly capture this show, so just look up in awe or look down and see your kids in awe! After Hallowishes we stayed in the hub for the Villains show and mix and mingle! 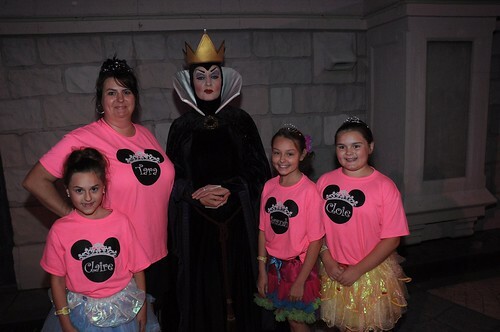 We love the Disney Villains (after all who would be making the Good Guys Good???? They would just be “guys” without the Villains) this show is a must see, it’s offered several times during the night, if you plan to “mingle” you need to get near the stage. I can still here their song in my head “yeah, it’s good to be bad”! 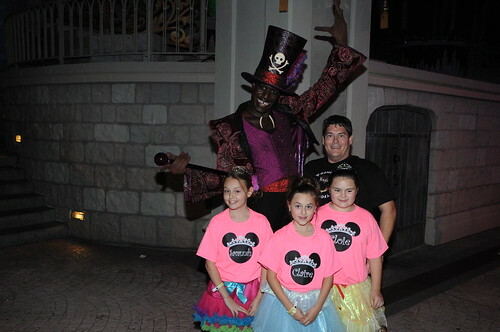 Folks in our group were able to get photos with Doctor Facilier, the Wicked Queen, and Captain Hook. 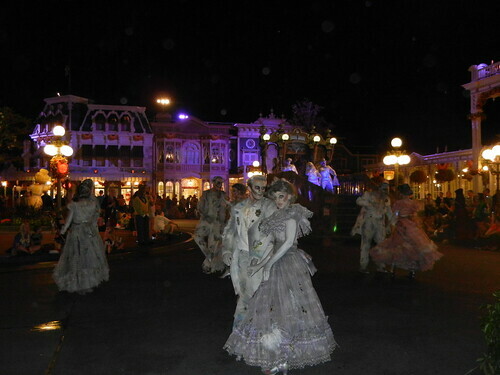 We made it back to the front of Main Street , just in front of the train station, as the 2nd Boo To You Parade came around. 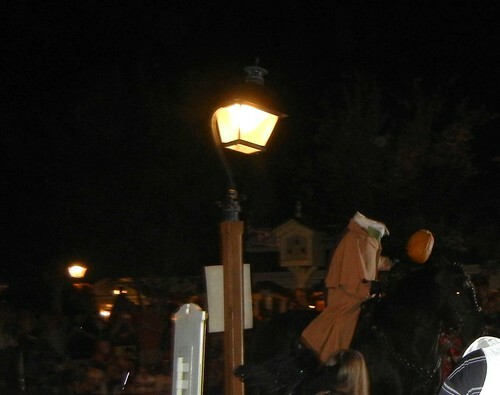 This time we had a great view of the “Headless Horseman” as he rode the route. Guess who we watched the parade with! The Tremaines! 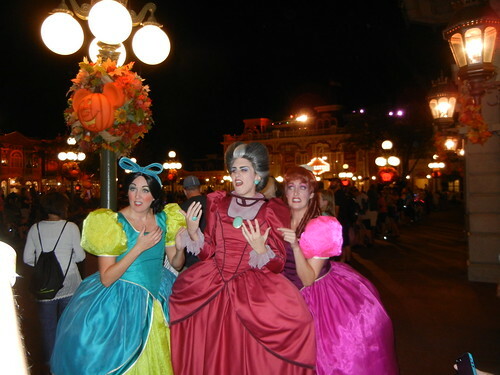 Lady Tremaine, Drizella, and Anastasia hung out with us. 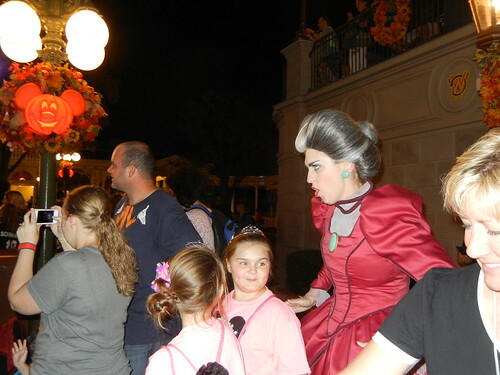 This was a great experience, Lady Tremaine was pointing out people in the parade to our girls, the villains that were “misunderstood” or “really good people” and the once that were “crazy” or to “avoid”. 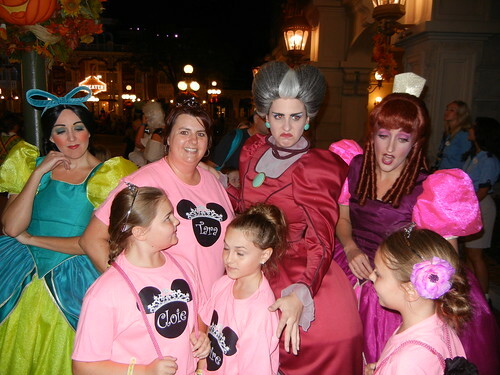 The “step sisters” were having a good time dancing with anyone and everyone, and posing for photos. 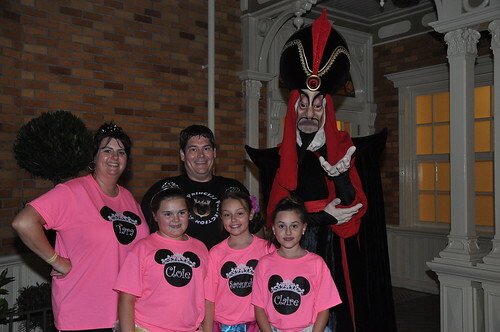 After the parade Jafar came out and we meet with him for a bit…. 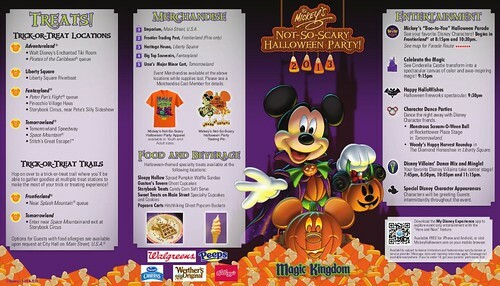 Over all if you love Disney, or love Magic Kingdom, you should give the Mickeys Not So Scary Halloween Party a try. There is so much to do, that you will have to make decisions on what to do and not to do, if you’re planning to go, get a map and list of activities EARLY before your trip or at least early in the day you plan to attend the party. 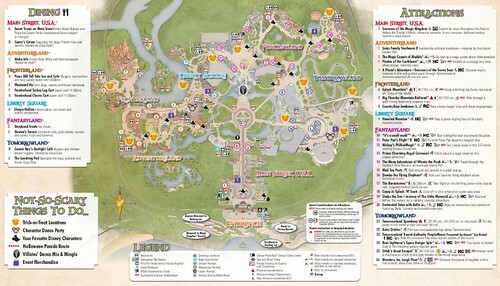 Decide what character meets, if any, are important for you, and allow time to get to the spots for the shows on time. We were over whelmed even with my over planning, we luckily were able to attend a second party later that same week. 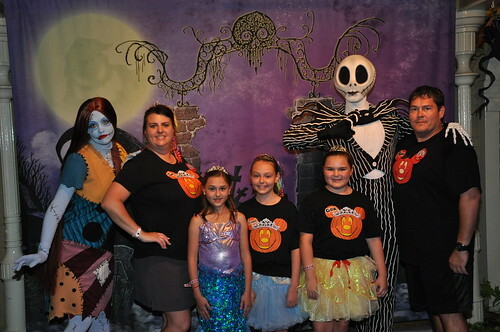 We missed things like the dance parties (Woody and Jessie host one in the Diamond Horseshoe and Mike, Sulley, and Monsters University gang host one over in Tomorrowland), we also missed Jack Skellington and Sally too during our 1st party (lines were over an hour all night). 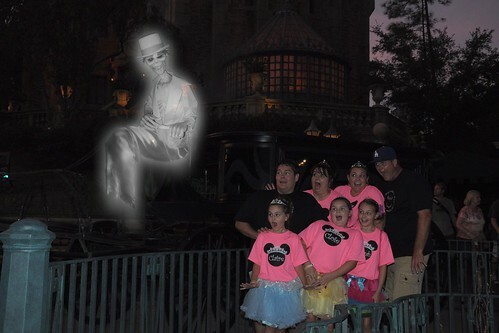 The MNSSHP gets a DisDads 2 thumbs up (or 5 out of 5 bacon and dolewhips) and is a must do item if you’re there during party times! We can’t thank Adam and his family enough for taking the time to write this review and allowing us to share their photos will all of you. 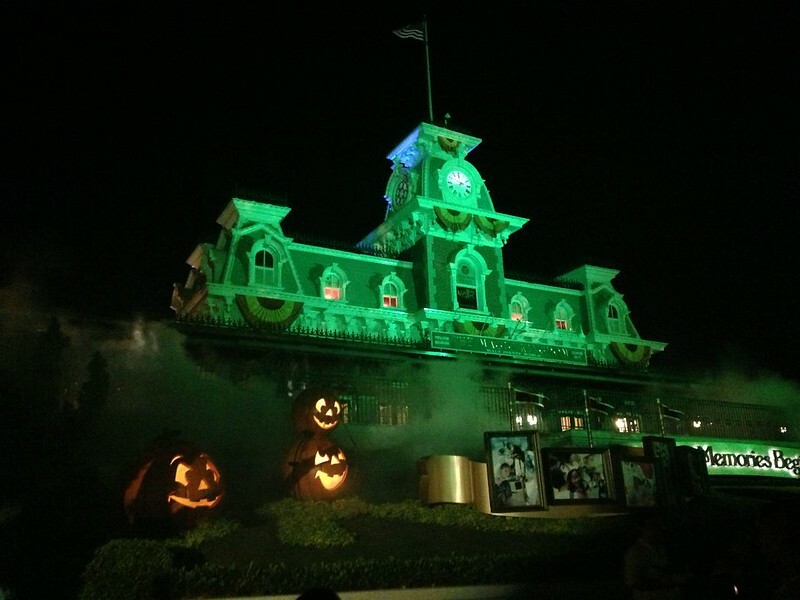 We’re even more eager to experience Mickey’s Not So Scary Halloween Party for ourselves someday! Have you been to Mickey’s Not So Scary Halloween Party? We’d love to hear your thoughts on it! And you can feel to share your pictures with us on our facebook page!